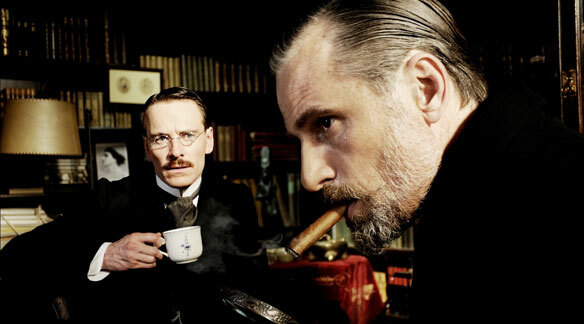 I am sure there is an interesting movie to be found in A Dangerous Method, but an affinity with the field of psychoanalysis is a must to find it. I don’t have that affinity. I have never been in therapy or have never felt compelled to pick up the works of Jung or Freud. It is like watching a baseball movie like Moneyball when you know nothing about the game and are not interested in it at all. That is how I felt about A Dangerous Method. That doesn’t mean I can’t appreciate the craft that made A Dangerous Method possible. It is a very skillfully made movie that goes into a lot of material with extreme care. At the center of the psychoanalytic vortex that David Cronenberg created are Viggo Mortensen as Sigmund Freud, Michael Fassbender as Carl Jung and Keira Knightley as Sabina Spielrein. These people are considered to be the bedrock of psychoanalysis. Their discussions revealed a lot of insight into the human psyche, insights that to this day continue to influence everyday life. These discussions are often riveting, while I don’t always follow what these people are talking about. They are played with verve by the principal players. Especially Fassbender and Mortensen are fascinating to watch. A small role for Vincent Cassel lights up the screen as well. Knightley I had the most problems with. She is competent, but I had a hard time getting past her faux Russian accent. In the end A Dangerous Method left me cold and perhaps this was intended. The psychoanalytic field is supposed to be devoid of emotion so the therapist can objectively treat his or her patient. In that light it isn’t all that surprising that A Dangerous Method didn’t pull me in as other examples of Cronenberg’s recent work has done, namely Eastern Promises, which was a perfect movie. There’s a lot of talking, but it never let me in to show me its secrets and I suspect it never will. This entry was posted in Biography, Drama, Thriller and tagged 2011, David Cronenberg, Keira Knightley, Michael Fassbender, Sarah Gadon, Viggo Mortensen, Vincent Cassel by mymovieyear2012. Bookmark the permalink.